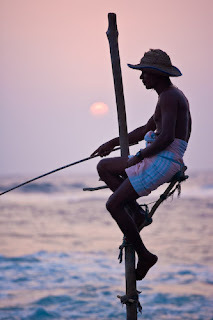 The iconic travel image of Sri Lanka is the famous stilt fishermen. Sometimes grouped in hundreds along the southern shores of the island, they rest on their perches, rods draped over their arms, waiting for the day's catch. So it wasn't a big surprise when the Creative Director sent through the shot list for the Sri Lanka assignment. There it was, right underneath coconut plantation: stilt fisherman. I'd talked the shot list through with Nisanka, my guide, right at the start. The bad news was our schedule was so tight we were only going to get one chance to get the shot. The good news was that chance was going to be at the end of the day, so I'd be able to shoot against the setting sun. We had a brief stop for lunch and to stretch our legs, but as the afternoon wore on I was starring to get edgy - here in the tropics the sun dropped under the horizon at 6.30 sharp. If we arrived after sunset then there was no shot, and our schedule meant I wouldn't get another chance. By 5.30 I had almost given up hope, but out driver made a Herculean effort, forcing his way through the traffic as the sun dropped lower and lower until we finally reached the sea and pulled up beside the a long row of stilts. I glanced at my watch - it was 6.20. The sun was about 3 diameters above the horizon, and quickly dropping into haze. Just one problem. The stilts were empty. While Nisanka raced to the local cafe to find some fishermen, I grabbed my camera, 24-105 lens and tripod, stuffed the 70-200 into the writer's hands and telling him to follow me, scrambled off over the boulders along the shore to set up the shot. I hadn't counted on the tide going out. The rocks were glistening with moisture from the departing sea, and sure enough as I lost my footing the camera came crashing down on the nearest boulder. My heart stopped. I picked up the camera and could see a huge scrape on the top plate where the black paint had been chipped away. I held it up to my eye and checked a few functions. It seemed to work. I took a picture - it showed up on the LCD. I checked the lens - not even the filter was broken. Against all the odds it looked like I had got away with it. By now a couple of fishermen had climbed up onto their stilts. My hands still shaking with the adrenalin, I took a few shots and began to concentrated on the most photogenic one. I asked Nisanka to tell him to lean back to give me separation between his hat and the stilt. I nailed the shot just before the sun disappeared into the haze on the horizon. It ran as the opening shot for the feature. Lesson 1: Buy tough gear - you never know what will happen. It's not the first time my 1Ds II has survived a big scrape and I'm sure it won't be the last. Lesson 2: Always carry a spare. If the camera had failed and I hadn't had my 1D II backup in the car, the assignment would have been over right there and then. And the chances are you'd never be hired by that publication again.